A few months after the end of the War, Pauling and the new head of Caltech's Biology division, George Beadle, delivered a twenty-five page grant request to Warren Weaver at the Rockefeller Foundation. It was the largest grant request Pauling had ever written. It was the biggest Weaver had ever seen: $400,000 per year for fifteen years. A total of $6 million. The size of the request reflected the grandiosity of the vision. Pauling and Beadle were proposing with one leap to make Caltech a global leader in molecular biology. Pauling (who wrote almost all of the proposal) used language that he knew Weaver could echo to his Board: The money would fund a coordinated attack on the great problems of biology over the next two decades; it would make possible an exploration of "the dark forest of the unknown" surrounding the structure and function of proteins, which Pauling and Beadle would explore as leaders of "a great expedition armed with x-rays and similar tools." They would uncover the secrets of enzyme action. They would lay bare the workings of genetics. They would explore the action of hormones and vitamins, the mechanism of nerve transmission and the activity of drugs. They would be supported by talented researchers armed with the latest technology: ultracentrifuges, chromatographs, spectrographs, electron microscopes, radioactive tracers, "the best...that can be made," Pauling wrote. A week later, Beadle visited Weaver and was happy to hear the returning grant director call the proposal "a magnificent plan." But Weaver's enthusiasm alone was not enough to sell the Rockefeller Board. Weaver was able to secure interim funding ($50,000 per year for 1946 and 1947), but it took the Board two years of discussion before it would make a final decision on Pauling's and Beadle's grand vision. Times had changed after the War. The federal government was now beginning to fund research at a much higher level. The old "benefactor of science" role for private foundations was changing. The Rockefeller Foundation was shifting its focus from basic science to the needs of developing nations. When the decision was finally reached in 1948, the numbers had shrunk. The Rockefeller Foundation ended up giving Pauling and Beadle $100,000 per year for seven years, considerably less than they had requested, but still a massive grant by the standards of the day. Supplemented with other funds Pauling and Beadle had solicited, it allowed a remaking of the Caltech chemistry and biology divisions. Under Pauling's and Beadle's guidance, the two units made Caltech into an international leader in the growing field of molecular biology. See Also: Letter from Linus Pauling to Warren Weaver. December 4, 1945. 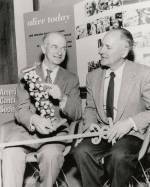 Linus Pauling, holding a model of the alpha-helix, seated next to George Beadle. 1950s. 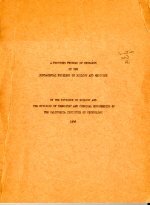 "A Proposed Program of Research on the Fundamental Problems of Biology and Medicine." February 14, 1946. "Beadle makes an exceptionally fine impression and is undoubtedly one of the most promising men of his age in Biology - a man to be watched."